This topic describes how to manually configure the Amazon Web Services (AWS) components that you need to run Pivotal Cloud Foundry (PCF) on AWS. To deploy PCF on AWS, you must perform the procedures in this topic to create objects in the AWS Management Console that PCF requires. To view the list of AWS objects created by the procedures in this topic, see the Required AWS Objects section. After completing the procedures in this topic, proceed to Configuring BOSH Director on AWS to continue deploying PCF. 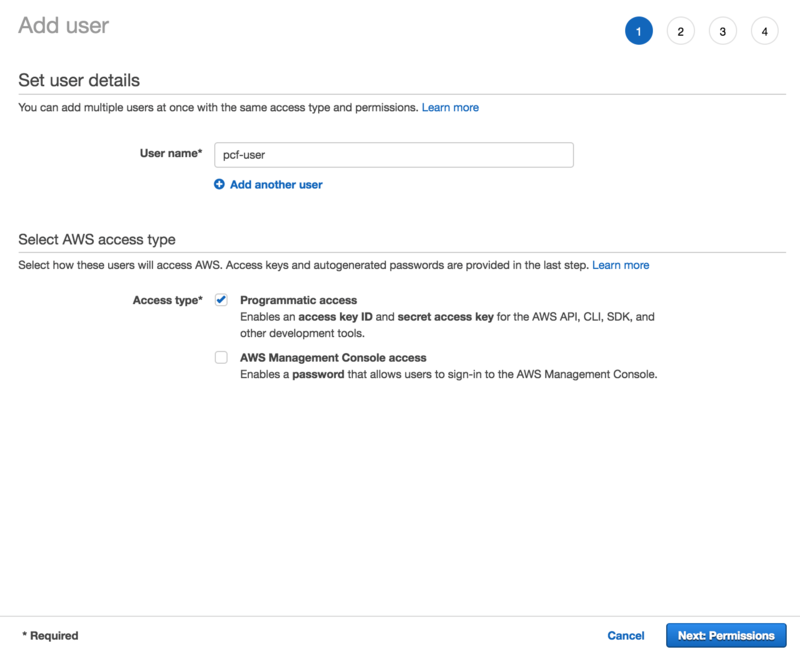 Log in to the AWS Management Console, and file a ticket with Amazon to ensure that your account can launch more than the default 20 instances. In the ticket, ask for a limit of 50 t2.micro instances and 20 c4.large instances in the region you are using. Note: To deploy PCF to AWS GovCloud (US), log in to the AWS GovCloud (US) Console instead of the standard AWS Management Console and select the us-gov-west-1 region. Note: To deploy PCF to AWS China, set up an AWS China account and contact the Platform Architect assigned for your Pivotal account. You can check the limits on your account by visiting the EC2 Dashboard on the AWS Management Console and clicking Limits on the left navigation. Navigate to the S3 Dashboard. Note:S3 bucket names must be globally unique. When naming buckets, Pivotal recommends that you prefix the generic names below with an unique and helpfully identifiable string (i.e. ID-STRING-pcf-ops-manager-bucket, MY-IDENTIFIER-pcf-buildpacks-bucket, and so on). Then you should use the same prefix when naming other associated resources, such as IAM policies. For Bucket name, enter ID-STRING-pcf-ops-manager-bucket. For Region, select your region. Repeat the above steps to create four more S3 buckets: ID-STRING-pcf-buildpacks-bucket, ID-STRING-pcf-packages-bucket, ID-STRING-pcf-resources-bucket, and ID-STRING-pcf-droplets-bucket. Click IAM to access the IAM Dashboard. Click Users and then click Add user. Enter a user name, such as pcf-user. For AWS access type, select Programmatic access. Note: If you prefer to create your keys locally and import them into AWS, see the Amazon documentation. Click Next: Review and review your choices. Note: On the Review page you may see a warning that the user has no permissions. You can disregard this message. You do not need to set user permissions. Click Download .csv to download the user security credentials. WARNING: The credentials.csv contains the IDs for your user security access key and secret access key. Keep the credentials.csv file for your currently active key pairs in a secure directory. You cannot recover a lost key pair. On the Users page, click the user name to access the user details page. Note: On the Users page you may see a warning that the user has no permissions. You can disregard this message. You do not need to set user permissions. Click Add inline policy. You can review your existing inline policies by clicking the down arrow. Copy the policy document included in the Pivotal Cloud Foundry for AWS Policy Document topic. You must edit the policy document so the names of the S3 buckets match the ones you created in Step 2: Create S3 Buckets. 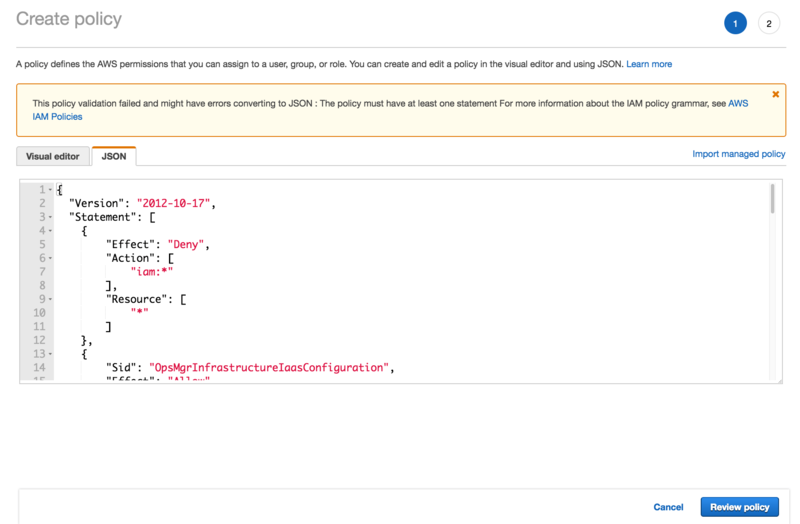 Paste the policy document into the JSON tab on the Create policy page. In the Name field, enter pcf-iam-policy. Click Create policy. The Summary page displays a list of available policies and actions. Navigate to the VPC Dashboard. IPv4 CIDR block: Enter 10.0.0.0/16. IPv6 CIDR block: Select No IPv6 CIDR Block. Public subnet’s IPv4 CIDR: Enter 10.0.0.0/24. Set the Availability Zone fields for both subnets to REGION-#a. For example, us-west-2a. Public subnet name: Enter pcf-public-subnet-az0. Private subnet’s IPv4 CIDR: Enter 10.0.16.0/28. Private subnet name: Enter pcf-management-subnet-az0. Create a key pair titled pcf-ops-manager-key. 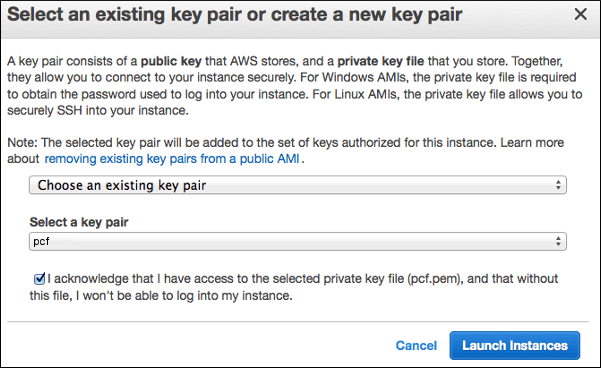 For more information about creating the key pair, see Amazon EC2 Key Pairs in the AWS documentation. Select your newly-created pcf-ops-manager-key for the Key Pair name. Enable DNS hostnames: Click Yes. After the VPC is successfully created, click Subnets in the left navigation. Note: You created the first two subnets in the previous step: pcf-public-subnet-az0 and pcf-management-subnet-az0. Return to the EC2 Dashboard. Select Security Groups>Create Security Group. For Security group name, enter pcf-ops-manager-security-group. For Description, enter a description to identify this security group. 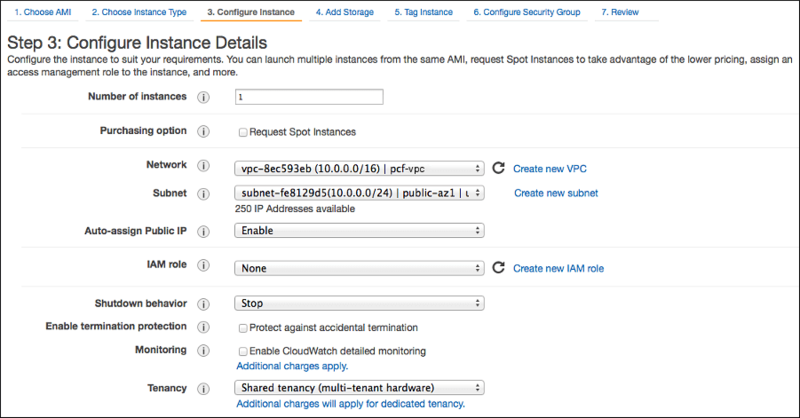 For VPC, select the VPC where you want to deploy Ops Manager. Click the Inbound tab and add rules according to the table below. Note: Pivotal recommends limiting access to Ops Manager to IP ranges within your organization, but you may relax the IP restrictions after configuring authentication for Ops Manager. From the Security Groups page, click Create Security Group to create another security group. For Security group name, enter pcf-vms-security-group. For VPC, select the VPC where you want to deploy the PCF VMs. Enables BOSH to deploy PAS and other services. Enables application VMs to communicate through the router. Allows the load balancer to send traffic to Pivotal Application Service (PAS). For Security group name, enter pcf-web-elb-security-group. For VPC, select the VPC where you want to deploy this Elastic Load Balancer (ELB). Click the Inbound tab and add rules to allow traffic to ports 80, 443, and 4443 from 0.0.0.0/0, as the table and image show. Note: Allow traffic to port 4443 only if you are in an AWS cloud region that does not support AWS ALBs. For example, the GovCloud region. For more information about AWS regoins and availability zones, see AWS Global Infrastructure. Note: For finer control over what can reach PAS, change 0.0.0.0/0 to be more restrictive. This security group governs external access to PAS from apps such as the cf CLI and app URLs. For Security group name, enter pcf-ssh-elb-security-group. 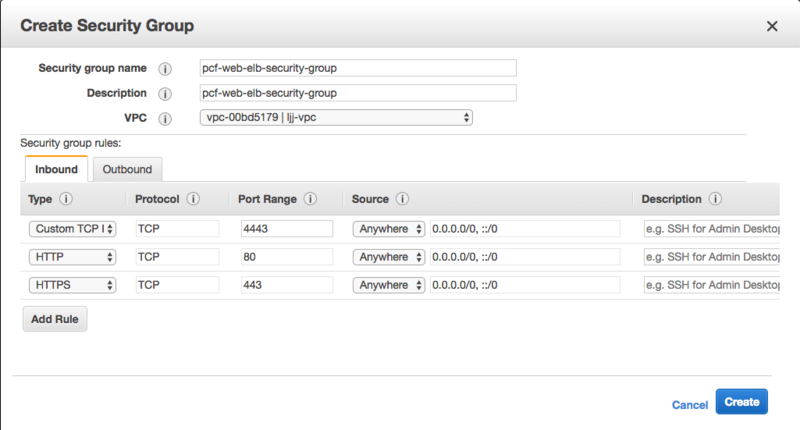 For VPC, select the VPC where you want to deploy this ELB. For Security group name, enter pcf-tcp-elb-security-group. For Security group name, enter pcf-nat-security-group. 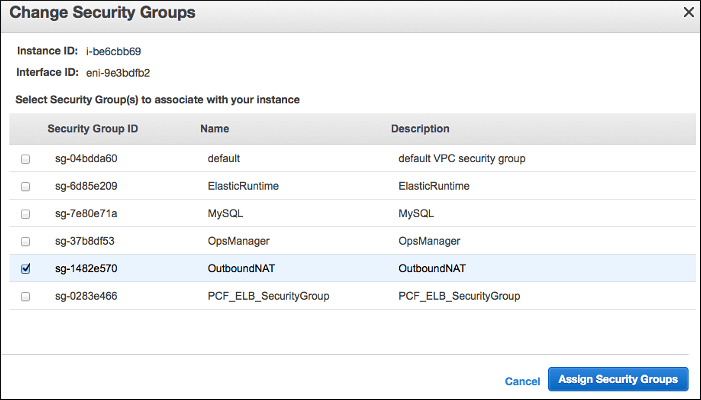 For VPC, select the VPC where you want to deploy the Outbound NAT. Click the Inbound tab and add a rule to allow all traffic from your VPCs, as the table and image show. Note: If you plan to use an internal database, skip this step. If you are using RDS, you must configure a security group that enables the Ops Manager VM and BOSH Director VM to access the database. For Security group name, enter pcf-mysql-security-group. 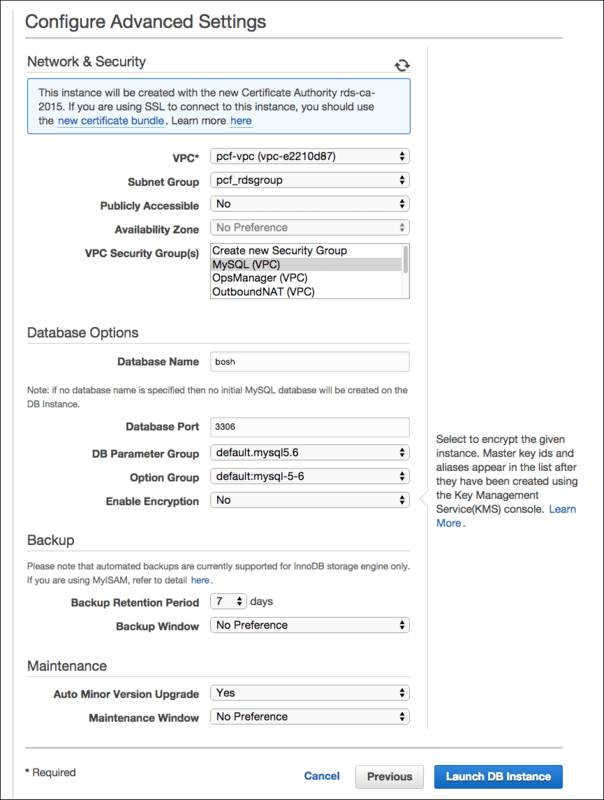 For VPC, select the VPC where you want to deploy MySQL. Click the Inbound tab. Add a rule of type MySQL and specify the subnet of your VPC in Source, as the table and image show. Click the Outbound tab. Add a rule of type All traffic and specify the subnet of your VPC in Destination, as the table and image show. Open the PDF and identify the AMI ID for your region. Under Application Load Balancer, click Create. For Scheme, select internet-facing to allow traffic from public IP addresses, or internal to allow traffic only from private IP addresses. For IP address type, select the type of IP addresses you want to allow. Under Listeners, click Add listener. For Load Balancer Protocol, select HTTPS. Under Availability Zones, select all availability zones. If you already have a certificate from AWS Certificate Manager (ACM), select Choose a certicate from ACM. If you do not have a certificate from ACM, select Upload a certificate to ACM. For more information, see Importing Certificates into AWS Certificate Manager in the AWS documentation. Note: For a production or production-like environment, use a certificate from a Certificate Authority (CA). This can be an internal certificate or a purchased certificate. For a sandbox environment, you can use a self-signed certificate. For Certificate Name, select the desired certificate. For Security Policy, select the policy you created in Step 3: Create an IAM User for PCF. Click Next: Configure Security Groups. Under Assign a security group, select Select an existing security group. From the list of security groups, select the pcf-web-elb-security-group security group that you configured in Step 7: Configure a Security Group for the Web ELB. Under Health checks, set Path to /health. Interval: Set to 5 seconds. Timeout: Set to 3 seconds. Unhealthy threshold: Set to 3. Health threshold: Set to 6. For Step 5: Register Targets, accept the default values and click Next: Review. For Step 6: Review, review the load balancer details and then click Create. 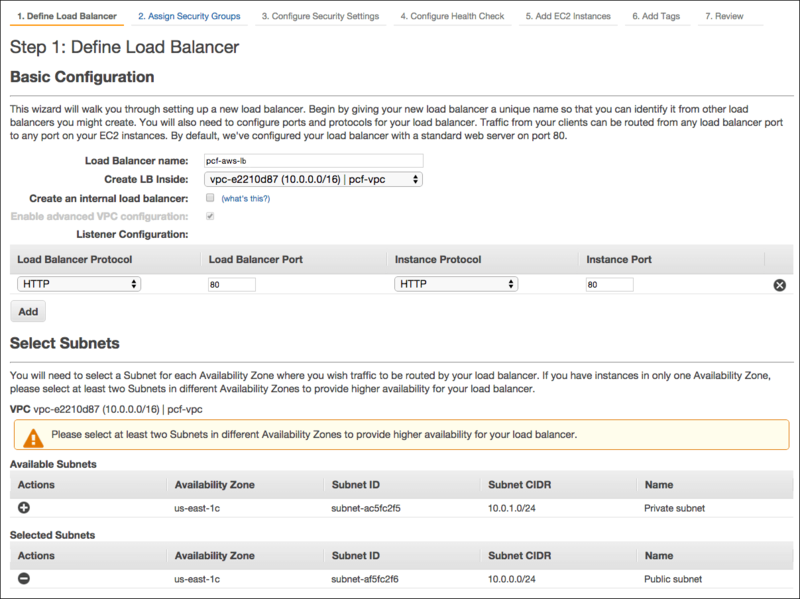 A message appears to confirm AWS successfully created the load balancer. From the Load Balancers page, click Create Load Balancer. Load Balancer name: Enter pcf-ssh-elb. Create LB Inside: Select the pcf-vpc VPC that you created in Step 4: Create a VPC. 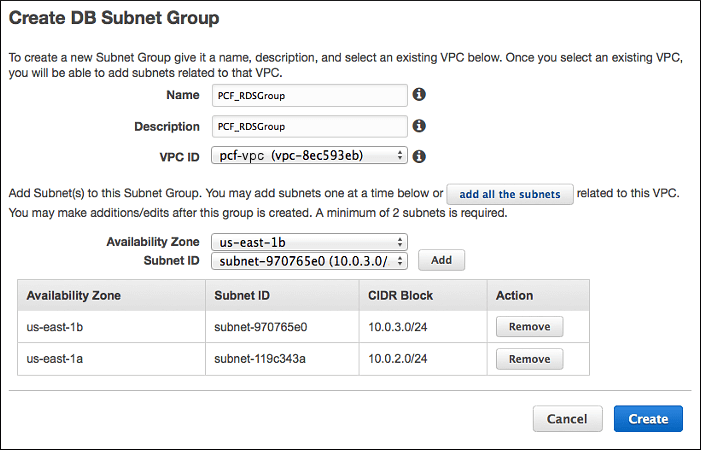 Under Select Subnets, select the public subnets you configured in Step 4: Create a VPC, and click Next: Assign Security Groups. On the Assign Security Groups page, select the security group pcf-ssh-elb-security-group you configured in Step 8: Configure a Security Group for the SSH ELB, and click Next: Configure Security Settings. On the Configure Security Settings page, ignore the Improve your load balancer’s security error message and click Next: Configure Health Check. Ping Port: Set to 2222. Response Timeout: Set to 3 seconds. Load Balancer name: Enter pcf-tcp-elb. The ... entry above indicates that you must add listening rules for each port between 1026 and 1123. On the Assign Security Groups page, select the security group pcf-tcp-elb-security-group you configured in Step 9: Configure a Security Group for the TCP ELB, and click Next: Configure Security Settings. On the Configure Security Settings page, ignore the Improve you load balancer’s security error message and click Next: Configure Health Check. Ping Port: Set to 80. From the Load Balancers page, select the load balancer. On the Description tab, locate the Basic Configuration section and record the DNS name of the load balancer. 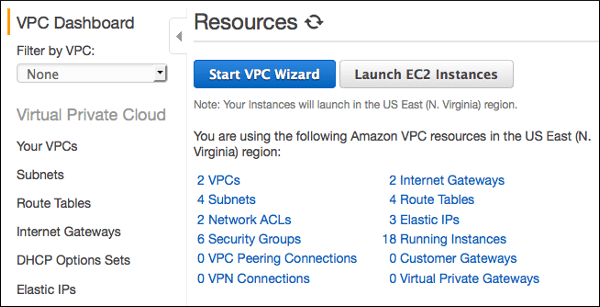 Click Instances on the left navigation to view your EC2 instances. Select the PcfOpsManInstance instance created by Cloudformation. On the Description tab, record the value for IPv4 Public IP. CNAME: *.apps.YOUR-SYSTEM-DOMAIN.com and *.system.YOUR-SYSTEM-DOMAIN.com points to the DNS name of the pcf-web-elb load balancer. CNAME: ssh.YOUR-SYSTEM-DOMAIN.com points to the DNS name of the pcf-ssh-elb load balancer. CNAME: tcp.YOUR-SYSTEM-DOMAIN.com points to the DNS name of the pcf-tcp-elb load balancer. A: pcf.YOUR-SYSTEM-DOMAIN.com points to the public IP address of the pcf-ops-manager EC2 instance. On the EC2 Dashboard, click Instances. Select the NAT instance, which has an instance type of t2.medium. From the Actions menu, select Networking>Change Security Groups. Change the NAT security group from the default group to the pcf-nat-security-group NAT security group that you created in Step 10: Configure a Security Group for the Outbound NAT. Navigate to the RDS Dashboard. Click Subnet Groups>Create DB Subnet Group. Description: Enter a description to identify this subnet group. Availability Zone and Subnet ID: Choose the AZ and subnet for pcf-rds-subnet-az0 and click Add. Repeat the steps above to add pcf-rds-subnet-az1 and pcf-rds-subnet-az2 to the group. The following screenshot shows a completed subnet group. Note: On the Subnet Group page, you may need to refresh the page to view the new group. Note: You must have an empty MySQL database when you install or reinstall PCF on AWS. Click Instances>Launch DB Instance to launch the wizard. Select the MySQL radio button under Production to create a database for production environments. DB Instance Class: Select db.m3.large - 2 vCPU, 7.5 GiB RAM. Storage Type: Select Provisioned IOPS (SSD). Allocated Storage: Enter 100 GB. DB Instance Identifier: Enter pcf-ops-manager-director. Enter a secure Master Username and Master Password. Note: Record the username and password. You need these credentials later when configuring the Director Config page in the BOSH Director tile. Subnet Group: Select the pcf-rds-subnet-group you created in Step 18: Create RDS Subnet Group. VPC Security Groups: Select the pcf-rds-security-group that you created in Step 11: Configure a Security Group for MySQL. Accept the default values for the remaining fields. Click Launch DB Instance. Launching the instance may take several minutes. When the instance has launched, proceed to Configuring BOSH Director on AWS to continue deploying PCF. This section describes the AWS objects you create in the procedures above in order to deploy PCF. Use this section to determine the resource requirements of PCF on AWS, or to verify that you created the correct resources after completing the procedures above. These buckets must be empty when you install or reinstall PCF. See Step 2: Create S3 Buckets. You must create an IAM user for PCF named pcf-user from the Identity and Access Management Dashboard, using the policy document included in the Pivotal Cloud Foundry for AWS Policy Document topic. See Step 3: Create an IAM User for PCF. You must generate a key pair named pcf-ops-manager-key. For more information about setting up a key pair, see Amazon EC2 Key Pairs in the AWS documentation. You must create a VPC with public and private subnets from the VPC Dashboard. The following table lists the subnets in CIDR block 10.0.0.0/16. See Step 4: Create a VPC. You must also assign the NAT instance to the pcf-nat-security-group. See Step 17: Secure the NAT Instance. The following sections describe the security groups you must create from the EC2 Dashboard. See Step 5: Configure a Security Group for Ops Manager. See Step 6: Configure a Security Group for PCF VMs. See Step 7: Configure a Security Group for the Web ELB. See Step 8: Configure a Security Group for the SSH ELB. See Step 9: Configure a Security Group for the TCP ELB. See Step 10: Configure a Security Group for the Outbound NAT. See Step 11: Configure a Security Group for MySQL. You must locate the public Ops Manager AMI using the AMI ID provided by the PDF downloaded when clicking Pivotal Cloud Foundry Ops Manager for AWS on Pivotal Network. See Step 12: Launch a Pivotal Ops Manager AMI. The following sections describe the ELBs you must create from the EC2 Dashboard. See Step 13: Create Web Load Balancer. See Step 14: Create SSH Load Balancer. See Step 15: Create TCP Load Balancer. You must navigate to your DNS provider and create CNAME and A records for all three of your load balancers. See Step 16: Configure DNS Records. You must create a subnet group for RDS named pcf-rds-subnet-group from the RDS Dashboard. See Step 18: Create RDS Subnet Group. You must create a MySQL database from the RDS Dashboard. 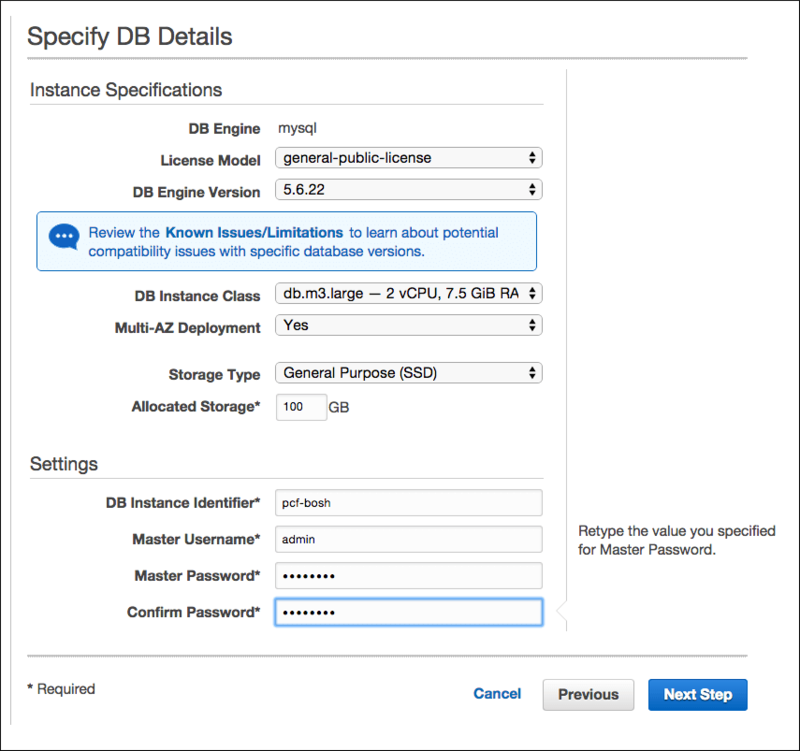 See Step 19: Create a MySQL Database using AWS RDS.